Definition at line 147 of file ClusterSequenceArea.hh. Definition at line 164 of file ClusterSequenceArea.hh. 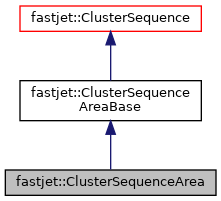 Definition at line 176 of file ClusterSequenceArea.hh. Definition at line 189 of file ClusterSequenceArea.hh.